Georgetownâ€™s Center for Education and the Workforce has published two new reports of interest to the CTE community. 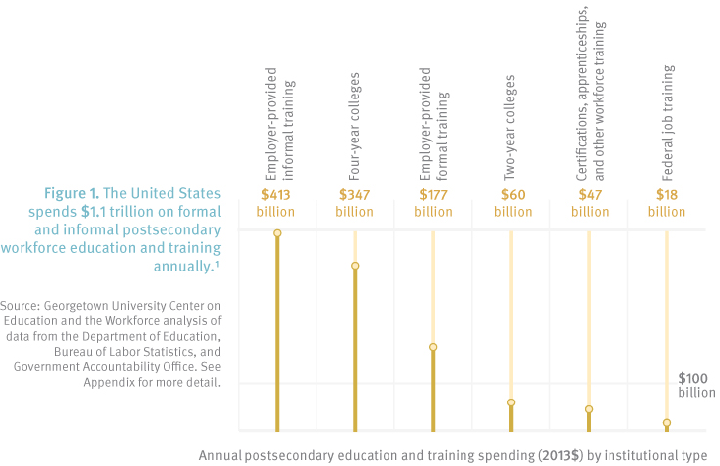 The first, â€œCollege Is Just the Beginning,â€ examines the world of post-secondary education and training and found that roughly $1.1 trillion is spent annually. Researchers split the sum between colleges and universities ($417 billion) and employers ($177 billion in formal training; $413 billion informal on-the-job training). However, that employer number comes with a caveat â€“ employers spend more because education providers may only have a student for a handful of years while an employer may have them for decades. The study also found that federally funded job training is the smallest component, ringing in at $18 billion. The cost of training also varies widely among industries depending on the intensity of the training. Manufacturing, for example, was found to be the most training intensive. The center also released a new report called, â€œThe Undereducated American,â€ which looks at the countryâ€™s number of college-going workers and claims that supply has failed to keep pace with growing demand since the 1980s, resulting in widening income inequality. A new public opinion poll from the Association of American Colleges and Universities found strikingly large gaps between employers and recent college graduates regarding career readiness. While the survey found that employers continue to overwhelmingly endorse the need for broad learning and cross-cutting employability skills, they gave their recent hires very low marks on 17 learning outcomes related to being well-prepared for careers. Meanwhile, recent graduates held a very different view of their preparedness with some of the largest gaps being critical thinking, written communication and working with others. A new report from the Government Accountability Office takes aim at state data systems. Despite the $640 million federal investment, the results are state systems linking education and workforce data that are riddled with holes. While the systems have had some success, there are many challenges remaining and questions about sustainability when federal funding goes away. This entry was posted on Thursday, February 12th, 2015 at 9:46 am	and is filed under Research. You can follow any responses to this entry through the RSS 2.0 feed. Both comments and pings are currently closed.